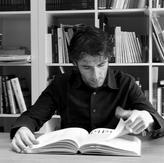 Fabio Flora is an Italian designer who looks for objects that represent archetype forms, functional and constructive. He tries to know the genesis. In his design process he analyses the symbolic values designing models made up from simple geometrical elements.